If you’ve recently been diagnosed with chronic kidney disease, finding a good nephrologist – a kidney doctor – is a must. A nephrologist is a kidney expert who will work with you to manage your kidney disease, develop a care plan that works for you and provide information on how to live well with kidney disease. See nephrologists we work with regularly, get tips on how to choose a nephrologist and find questions to ask at your first appointment. Your doctor might have relationships with local nephrologists and be able to recommend one for you. Getting a recommendation from a close person you trust is also a good place to start. 3. Do an online search. Find nephrologists and read online bios. Once you select a nephrologist, call their office to see if they accept your insurance before you go to see them. 5. Reflect after your first few appointments. Make sure you’re happy working with your nephrologist and are confident he/she can help implement the best care plan for you. Is there anything I can do to slow my kidney disease down? In short, yes! Diet and exercise play a key role in kidney disease. Following a kidney-friendly diet and exercising regularly can help you feel better ­and help slow your kidney disease down. To start, find nutrition information and exercise tips to work into your daily life and speak to your nephrologist about how to adapt these for your personal needs. 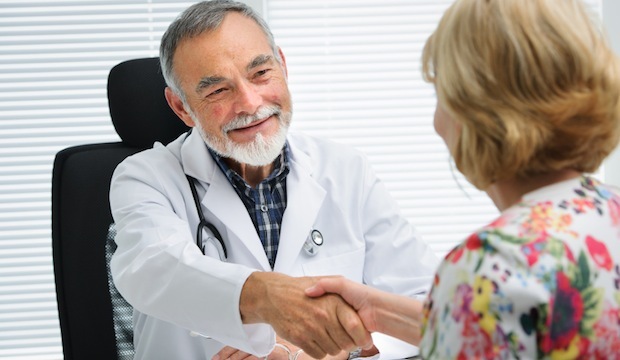 Most kidney patients see their nephrologist about once a month but it’s best to ask your nephrologist about your meeting plan at your first appointment. Your nephrologist will be able to explain the treatment options that are available to you. This could mean dialysis, either hemodialysis or peritoneal dialysis, or a kidney transplant. Explain your needs to your doctor – for example, if you’d like to work or travel while undergoing treatment – and your doctor can let you know what treatments might work best. Before your first appointment, find out more about dialysis and kidney transplant so you know the basics when you sit down to talk things over. Can I keep working while on dialysis? Many patients are able to fit dialysis treatments around their work schedule. If it’s a flexible dialysis schedule that’s important to you, home dialysis might be your best option. If working is important to you, make sure to mention this to your nephrologist at your first appointment. The kidney diet seems really tough. Do I have to follow it so strictly? Most likely, yes. But, a low-salt diet doesn’t have to mean low-taste. There are plenty of kidney-friendly recipes you can try that taste good and adhere to your diet. I feel overwhelmed. Are there any support groups or other resources for kidney patients? Yes! We offer Support Groups at all of our centers. Some meet monthly, while others meet quarterly. The groups are hosted by one of our social workers and a member of The Road Back to Life, a nonprofit organization founded by former Puget Sound Kidney Centers patients who provide mentoring and peer support. The groups address a variety of topics, including transplant, home dialysis and adjustment, and are an excellent source of information for people new to dialysis. Our Everett support group has also started an Arts and Crafts Group comprised of in-center and home patients who meet monthly to chat and design projects, some of which have sold in local fairs. Please contact us at 425-259-5195 to learn more or ask your nephrologist for other support groups you could join.